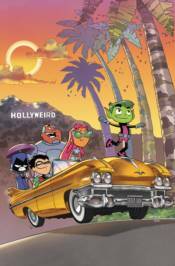 The Teen Titans are the hippest superhero gang around, and always know the latest trends! So when a new time-wasting gadget is Jump City's latest craze, and no one's getting anything done, the Titans investigate. Can the team pull together to find the gizmo Fun Gus 'Among Us'? Then, the Titans discover a new neighborhood treat when Jump City becomes 'Grounds Zero' for the caffeine craze sweeping the nation! Plus, the Titans finally got their movie and all the fame and glamour that went with it. But are they doomed to wallow after their 15 minutes of fame are over? This all-ages title includes issues #25-30!